A biconvex lens. Pocket size. The sliding frame is designed for the storage of the lens after use. It is good for the preliminary inspection of microscopic specimens. It is lightweight and has excellent chromatic correction with a reasonably wide field of view. 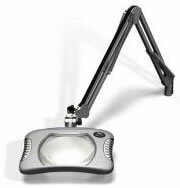 The magnifier helps the user eliminate bulky and heavier conventional magnifiers. 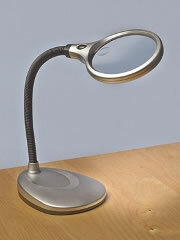 A desktop portable magnifier with gooseneck that allows your hands to be doing other things. It may be used as an alternative to a dissecting microscope. It works with an AC adaptor or batteries. Both the adapter and batteries are sold separately. 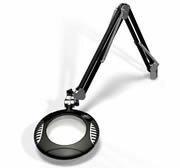 This magnifier is easily maneuvered with the palm of your hand. The magnifier has an automatic switch off feature which turns the light off automatically after 30 minutes. The magnifier comes in a protective case. The magnifying glass introduced here is the new version of the classic magnifying glass used by the famous detective Sherlock Holmes. This achromatic is more defined in its function and can give you more accurate details of the subject to be observed. 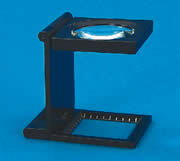 This magnifier is composed by two optical glass lenses, which are cemented together. The image seen through this lens is free of color and gives sharp contours so that no vague lines will be found throughout the entire image field. With a solid red wood handle and a red mark at the base of the lens frame, this reminds you to use the face having this red point upwards. Lightweight, compact, and simple; it comes with a measuring scale on the base frame. Base size is 1 square inch opening; marked every 1/8" on two sides and every millimeter on two other sides. Comes with 6X magnifier lens in a black anodized aluminum body. Folds flat when it is not in use. A flashlight is attached to the magnifier that illuminates poorly lighted background making it bright and clear for easy observation. A variety of types and magnifications are available. Comes with a large square magnifier lens which measures 50mm/side. The lens is removable and the flashlight can be used alone. A simple and accurate comparator. High quality measuring scale; detachable flashlight. High quality magnifier lens. Very convenient to see details under poor lighting conditions. Scale magnifier 15X (EMS # 68158) is attached to an illuminating device to improve the visibility. Comes with one metric scale. Battery is not included. For high performance. Well designed. The 8X magnifier uses a 24mm x 37mm angular objective lens and a two-element achromatic lens for the eyepiece. This arrangement enables the 8X magnifier to cover the entire 24mm x 36mm picture area of a single frame of 35mm film, and it is suitable for checking negatives. Engraved on the bottom edge of the transparent acrylic skirt is a 30mm long, 1mm division scale, which does not interfere with the field of view. With all of these features, you should have one for every day use. This device when fitted to the 8X magnifier (68125) enables you to view and check the 35mm roll film while marking the desired frame by depressing the puncher (located on the side of the device). The puncher punches out a V-shaped piece of film on the perforation to mark the frame. When fitted in the reverse position to the 8X magnifier, you are able to view and check the slides.